In the video released during a press conference Monday, police constantly say "put the knife down" and "drop the knife" but the man, identified as Caleb Hill, keeps running. 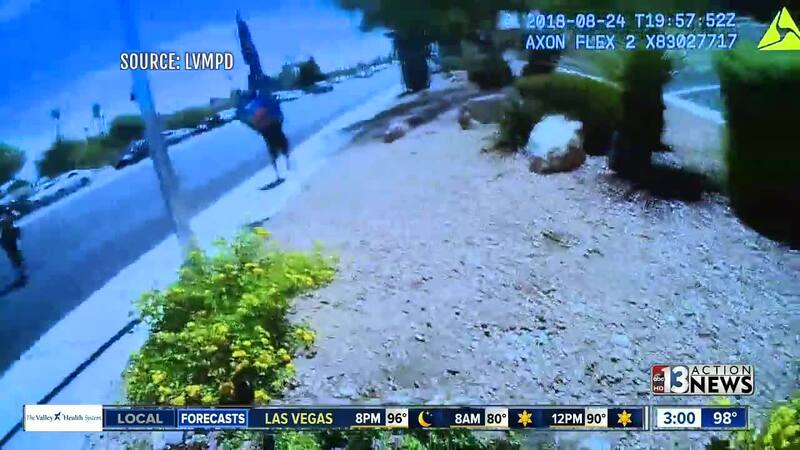 Las Vegas police released body-camera video of a stabbing suspect running away from officers on Friday before being shot. In the video released during a press conference Monday, police constantly say "put the knife down" and "drop the knife" but the man, identified as 38-year-old Caleb Hill, kept running toward an RTC bus stop located on Rainbow Boulevard near Spring Mountain Road. Police attempted to use a Taser, which hit the man's backpack, and five bean bag rounds, but it was not effective. Police said Hill had a long criminal history dating back to 1998, including battery, possession of stolen property and numerous drug charges. Police said there were potential illicit drugs in the man's system when he was shot but they are awaiting toxicology results. The shooting occurred around 1 p.m. Friday. Police said the man stabbed a woman on the bus before getting off the bus and stabbing another woman. Police reiterated Monday that the attack was unprovoked by the two victims, who have been released from the hospital. Hill remains hospitalized in critical but stable condition, police said. He faces two counts of attempted murder and a charge of resisting a public officer. WATCH THE PRESS BRIEFING BELOW. WARNING: THE VIDEO MAY BE GRAPHIC FOR SOME VIEWERS.